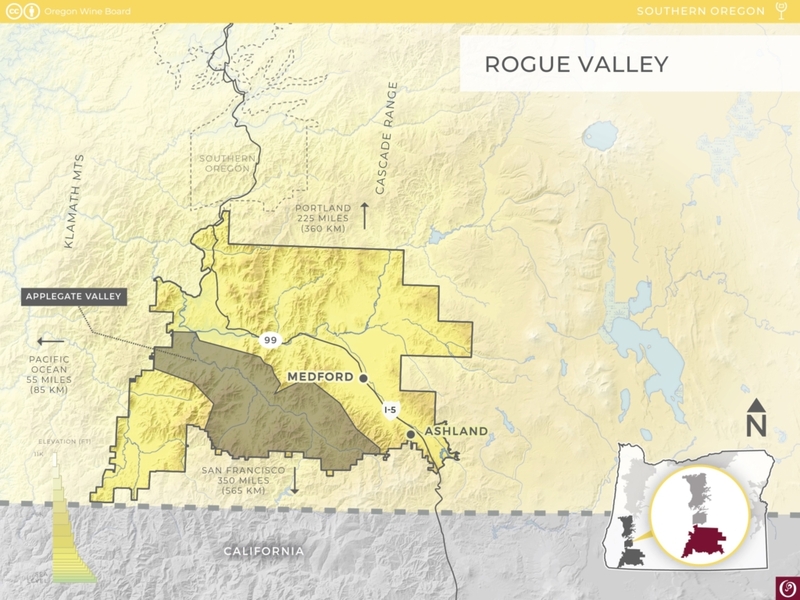 The Rogue Valley AVA is the southernmost winegrowing region in Oregon. It is defined by the Rogue River and three tributaries – Bear Creek, Applegate and Illinois rivers – that extend from the foothills of the Siskiyou Mountains along the California border north to the Rogue River. It is 70 miles (110 km) wide by 60 miles (95 km) long and encompasses the Applegate Valley AVA. Vineyards here are typically at elevations of 1,200 to 2,000 feet (365-610 m) and are planted on hillsides rather than valley floor. 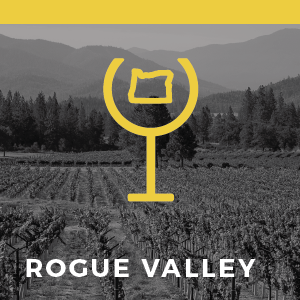 Rogue Valley is made up of three distinct valleys with progressively warmer micro-climates, enabling the region to successfully grow both cool- and warm-climate grape varieties. To the west, the region is affected by mountain and ocean influences, making it suitable for some cool-weather varieties, including Pinot noir. Farther east, Rogue Valley has the highest elevations (nearly 2,000 feet (610 m)) of Oregon’s winegrowing regions, but it is also the warmest and the driest, making it well suited for warm-weather varieties including Merlot, Cabernet Sauvignon and Sauvignon blanc. Generous sunshine and warmth during the growing season allow later-ripening varieties to thrive, resulting in fully developed fruit character and rich, full-bodied wines. Rogue Valley’s wine history dates back to the 1840s, when European immigrants began planting grapes and eventually bottling wines. In 1852, an early settler named Peter Britt joined in on the grapegrowing adventure, though it wasn’t until 1873 that he opened Valley View Winery – Oregon’s first official winery. Valley View closed in 1907 (though its name was resurrected by the Wisnovsky family in 1972), then Prohibition began. It wasn’t until after an Oregon State University professor planted an experimental vineyard here in 1968 that winemakers rediscovered the Rogue Valley as a superb winegrowing region. Rogue Valley became an official appellation in 2001.